Download eBooks and audiobooks from your library directly to your Windows Phone! OverDrive Media Console gives you on-the-go access to eBooks and audiobooks from your public, school, or college library. More than 18,000 libraries worldwide offer best-selling and classic titles via OverDrive, so use the 'Get Books' feature in the app to find a library near you. 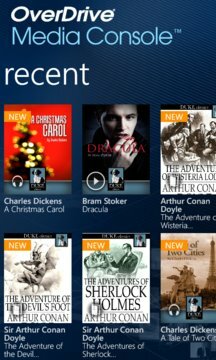 Digital titles from your library are borrowed just like print material. Once you find your library using 'Get Books,' you can browse your library's digital collection website in the app, check out a title with a valid library card, and download the title directly to your Windows Phone. While borrowing the digital title, you can enjoy it using the app's eBook reader or audiobook player. Each EPUB eBook and MP3 audiobook that you check out has a lending period. The title automatically expires in the app at the end of the lending period, so there's never a late fee. There's even a handy countdown clock built into the app so you know how long you have to read or listen before the title expires. What happens if a digital title is already checked out? Just like with physical material from the library, you can join a waiting list. All you need to do is enter your email address and you'll receive an alert when the title is available for check out. Don't want to wait? Many libraries offer thousands of EPUB eBook downloads that are always available. Just check for the 'Additional eBooks' link at the bottom of the digital collection homepage and you can get a free eBook from your library that's yours to keep—without a lending period. You can also download DRM-free EPUB eBooks from other online sources using 'Get Books'. Want more books? 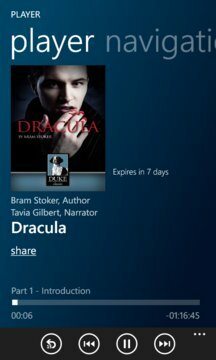 Contact your library and let them know that you are using OverDrive on your Windows Phone and would like to see additional titles in the digital collection.